1ste Platoon (Ammunition handler on 3rd gun) B. Company 643rd TD BN. 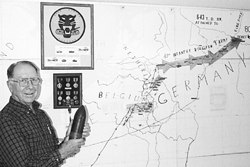 Like his office, Bernie's basement holds quite a collection of Battle of the Bulge material, such as the large wall map, models and pictures of military vehicles, his World War II insignia and medals, and this three-inch tank destroyer shell. 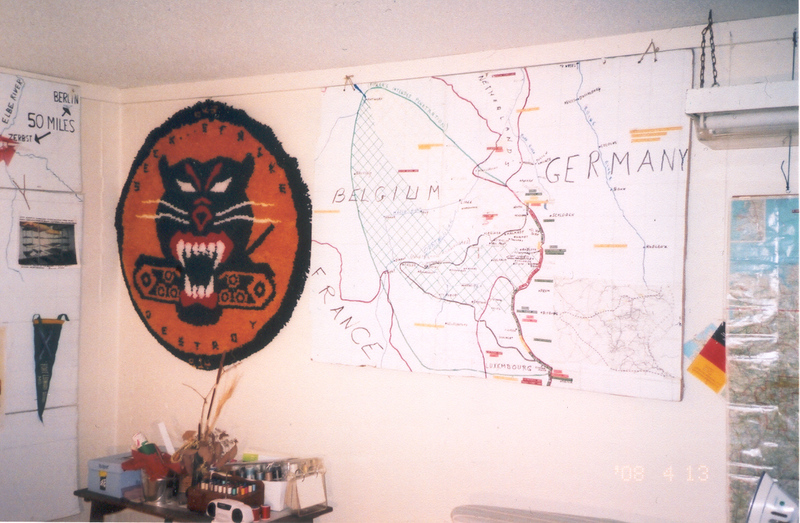 On May 17th, 2008 I received several photos from Bernie's basement..... and documents of the 643rd Battalion History. Bernie was inducted into the Army at the Wall Street Armory in Toledo on December 15th, 1942. He was in "... for the duration, plus six months." "On December 22nd, I reported to Camp Perry," he says. "There were 24 of us from the Bowling Green area in the same outfit, including my best friend and next-door neighbour, along with a fella I'd gone to church with. On Christmas Day in 1942, I was doing KP at Camp Perry. On the 27th, we shipped out by train for Camp Hood, Texas ... the home of the tank destroyers. "Of course, the Army wasn't about to share any information with us and we didn't have any idea where we were going when we left Camp Perry. We kept looking out of the train at automobile license plates and highway route markers to figure out what states we were going through. "One of the fellas with me had requested the Air Force. There were lots of air bases in Texas. And when it became apparent we were going there, he was real happy about it. "I'd requested an assignment with ordnance, since I'd worked with that at the proving ground. Well, when we disembarked from the train, all the trucks waiting for us were from the 608th Tank Destroyer Battalion. No Air Force. No ordnance." After three weeks in Texas for shots and orientation, Bernie's outfit was shipped to Fort Leonard Wood, Missouri for basic training. "In April, we went on field manoeuvres until June," he says. "Then we were moved to Camp Atterbury, Indiana and told we were going overseas. But then, believe it or not, the 608th was deactivated because we had self-propelled tank destroyers with 3-inch guns and the Army, in all its wisdom, had decided to convert to TOWED three-inch guns. It took only a five-man crew on a self-propelled, but a towed gun required a 10-man crew." 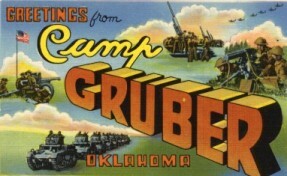 The men from the 608th were spread among four other outfits, with Bernie being assigned to the 643rd Tank Destroyer Battalion in Camp Gruber, Oklahoma. "I'd been a radio operator with the 608th," he says. "But I was assigned as a gun crew member in the 643rd." Bernie was in Oklahoma from December of 1943 until the following August. "I spent D-Day ... June 6th ... in Camp Gruber listening to radio reports of the Normandy landings and praying for our guys," he says. At the end of August, the 643rd was moved to Camp Miles Standish near Boston. 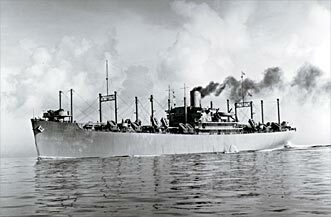 was about the same size as a Liberty ship. We had gas-pipe racks and canvas hammocks in the hold. That September was really hot on the Atlantic and the hold of that ship was miserable. But the sea was pretty smooth and I never got seasick. "On the 13th, I celebrated my 22nd birthday off the coast of England. 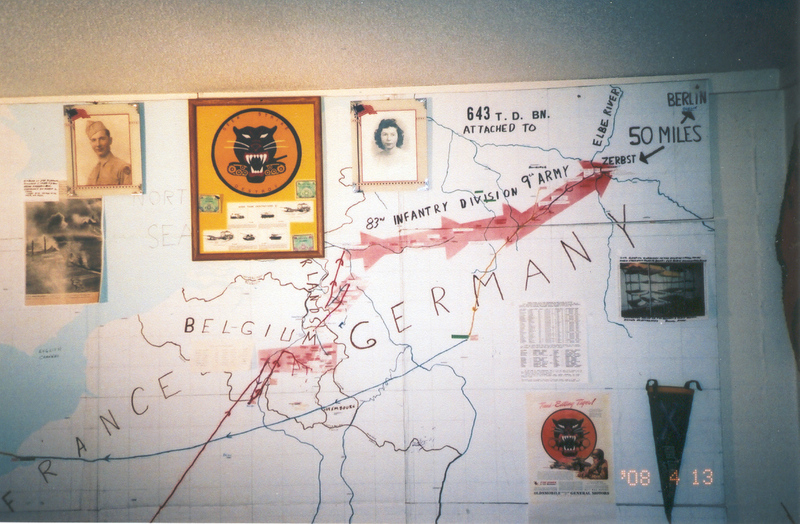 We landed in Cherbourg, France on the 15th without any equipment and set up a tent camp in an orchard at Valognes. Not a day went by when it didn't rain. "Our equipment was in transit and didn't arrive until November. Then we went to a town called Granville and did shore patrol for a couple of weeks." In late November, Bernie's outfit was moved to Fontainebleau, south of Paris. "We slept in French barracks that had facilities not only for men but also for horses," he says. "There were no horses there then, but our mess hall was set up in the stable so we had the aroma of horses mixed with the aroma of food. Every time we went to the motor pool, we had to walk past the entrance to Napoleon's castle. "On December 19th, they moved us about seven miles to a beautiful place. They called it a chateau, but it looked like a castle to me. It was a beautiful building about 40 miles from Paris with stables and quarters for servants or soldiers. We were told we'd be there for awhile and that suited us just fine. "Some guys stayed up all night getting ready to go to Paris the next day. But I was really tired and I just hit the sack. The next morning at 5, they rolled us out into the rain and headed us north. It was cold and it began to snow. "That was December 20th, four days after the German breakthrough that had started the Battle of the Bulge. We knew something was going on to the north, but we had no idea how important it was." The 643rd Tank Destroyer Battalion was attached to the 3rd Armored Division of the First Army. On December 21st, the 643rd arrived in Namur, Belgium, at the point where the Sambre and Meuse rivers meet. "We were within the sound of the guns," Bernie says. "Then we were ordered to Rheims, France and we headed there. But before we got very far, an officer caught up with us and ordered us to turn around again and head back north. "We towed our tank destroyer guns with half-tracks. There were 10 men to a crew and we carried 110 rounds of three-inch ammunition for the big gun. We rode on the half-track, sitting around the ammunition. "Of course, we had our small arms. I carried a .30-caliber carbine. Our sergeant carried a .45-caliber grease gun ... a submachine gun. He always walked around with his hand over the end of the barrel. And one day he and the lieutenant were walking down a stairway and he slipped ... and shot himself in the hand. They tried to court-martial him for shooting himself and it took lots of letters from the lieutenant to convince the higher-ups that it had been an accident. "We got to Soy, Belgium ... pretty much at the western extension of the Bulge ... early on the 22nd and went into action that afternoon. It was cold and there was snow. "While we were waiting to move into Soy, we were looking into the town and could see nine American tanks in a line along a ridge. They were from the 3rd Armored Division, which we were attached to. We finally discovered that all nine tanks had been knocked out. The Germans had picked off the first tank, then the last one and then methodically knocked off each one in-between. "As we were going toward Soy, we met tank after tank and support vehicle after support vehicle withdrawing. While we were sitting there in the half-track ... on 110 rounds of three-inch ammunition ... we started getting explosions about 50 yards away. I was sitting on all this ammo watching this incoming artillery explode. "There was an Armored infantry platoon near us and they immediately hit the ground. I was watching them and the explosions. One explosion took the end off a house to our right front. "Finally the infantry guys told us we'd better start taking some precautions if we wanted to stay alive. And that was the first I realized that we were really in combat and not in training. It was the real thing! And by that time, I'd been in the Army more than two years! Bernie's outfit setup its gun at a road block just outside of Soy . "There was a straw stack near us," he says, "and we slept on the straw. We each had two blankets, an overcoat and our regular clothing. "We never took our clothes off ... except for our boots. We'd sleep with one boot under each armpit, trying to keep them warm ... and more importantly so we'd know where they were if we had to have them in a hurry. We tried to dry them out as much as we could, but they were always wet. We weren't issued overshoes until January 20th. Our feet were always wet and cold ... that was the Battle of the Bulge. "Anyway, our gun never fired a shot from that roadblock. For some reason, the Germans never came down our road. We always figured it was because we smelled so bad! We were shelled by German artillery, but we couldn't find any targets for return fire. "As the battle developed, five American armies faced three German armies. We were transferred to the Ninth Army under General Montgomery. We never liked Montgomery because he'd stick the Americans out front to do the dirty work and hold his British units back. On January 2nd, we went into action with the 82nd Airborne Division." Through the terrible weather of January, the Allied troops slowly advanced through the dark Ardennes Forest, pushing back the Bulge that had been created when the Germans had broken through. By January 28th, the American soldiers once more stood on the line they had occupied on December 16th. Over a million soldiers had engaged in combat. American casualties totalled 80,987, while German casualties totalled 81,834. Massive numbers of destroyed American and German military vehicles littered the roads. When the Battle of the Bulge ended, Bernie's outfit was attached to the 82nd Airborne, near the German border where the break-through had first occurred. "We were east of Malmedy," he says. "That was where a German task force ... Kampfgruppe Peiper ... had murdered nearly 100 American prisoners of war during the first days of the Bulge. "The worst shelling I had to go through was with the 82nd. We'd set up our guns around a chateau. We'd seen four or five Sherman tanks going in, so we thought we weren't going to be alone. But they all got knocked out. "Early in the morning, three of us started to go see if there was anything we could salvage from the tanks. We got just outside the chateau and all at once German artillery started throwing in tree bursts. "One guy got some shrapnel through his hand and another got some through his chest muscle, but it didn't go into his chest cavity. The guy with the hand wound went back into the chateau basement. I darted through a doorway into a two-hole privy that was built right into a corner of the chateau. The guy with the chest wound got knocked down and he crawled underneath a steel truck bed, between it and a tree. "The barrage would be intense and then slacken off and quit. And just about the time we thought we could go back out, in would come some more shells. The Germans would pause until they thought we'd be moving out into the open again and then throw in some more rounds. "I kept track of the guy under the truck bed and he signalled that he was okay ... more or less. I thought I was safe in the basement of the chateau. I got a window blown all over me, but didn't get hurt. After that, I tried to keep solid walls all around me if I could. "We were also attached to the 30th Division and remnants of the 106th Division at different times during the Bulge. The 106th had been run over by the Germans early on and lost two regiments." After the Battle of the Bulge, Bernie's outfit moved to northern Belgium and stayed there for three weeks. "We were getting replacements, getting refitted and waiting for the Ruhr River to recede," he says. "The Germans had bombed the dams along the river and flooded the area, plus we'd also had lots of rain. "On the 24th of February, we crossed the Ruhr at Julich. And that's when I saw my first jet airplane. It was a German jet that kept trying to bomb the pontoon bridge we were using for the crossing. He'd make a run, then make a U-turn, come back, drop his bomb and disappear. Then either another jet or that same one would come back later and try again. I never knew if there was more than one or not. But there was never more than one visible at the same time. "Our anti-aircraft would put up what looked like a solid wall of tracers and flak, but the gunners just couldn't find the proper lead and catch up to the jet. There were spent anti-aircraft slugs and shrapnel pieces raining down all around us. We got under cover and watched. It was really something to see." Bernie's outfit moved on to the east. And on the third day after the Ruhr crossing, they were in Muntz. "In the evening," he says, "we saw a German jet again and we moved into an alley about 10 feet wide between two buildings. There were four of us there watching the jet and the anti-aircraft fire. "I decided to go in and write a letter to my girl ... Janice Lehr of Arlington. 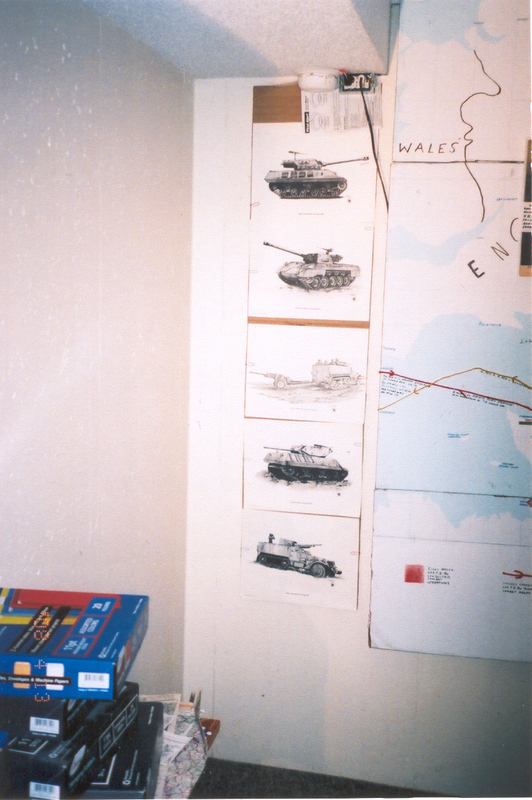 We'd met the night before I was inducted into the Army and we'd been writing ever since. "Anyway, I took a couple of steps toward the door and all of a sudden I was down. I told the other three guys I was hit. There was no pain, but I was numb from the waist down. I had no idea where I was hit, but I couldn't move my left leg. There was no immediate pain when the bullet went through. "They got me inside and called a medic and the executive officer. The guys with me cut my pants open and told me it looked as if someone had pushed a pencil through my leg. It was a bullet from one of our own .50-caliber anti-aircraft guns that had gone through my left thigh. "The executive officer said, 'Haas, I'll give you a million dollars for that wound!' "I remember saying, 'Sir, I'm keeping this one. You'll have to get one of your own.' That was February 27th, 1945. "When I left for the rear, a bunch of our guys were beginning to roast some German chickens they'd just liberated. That's my last memory of the front ... G.I. 's roasting liberated chickens." Bernie went to a field collecting station for the wounded and the next morning he was transported to Aachen. "In Aachen, a nurse got me to put on some pyjama bottoms," he says. "When we got my pants off, we found the bullet that had gone through my thigh. It apparently hadn't had enough momentum to go back out through my pants. I still have that bullet." 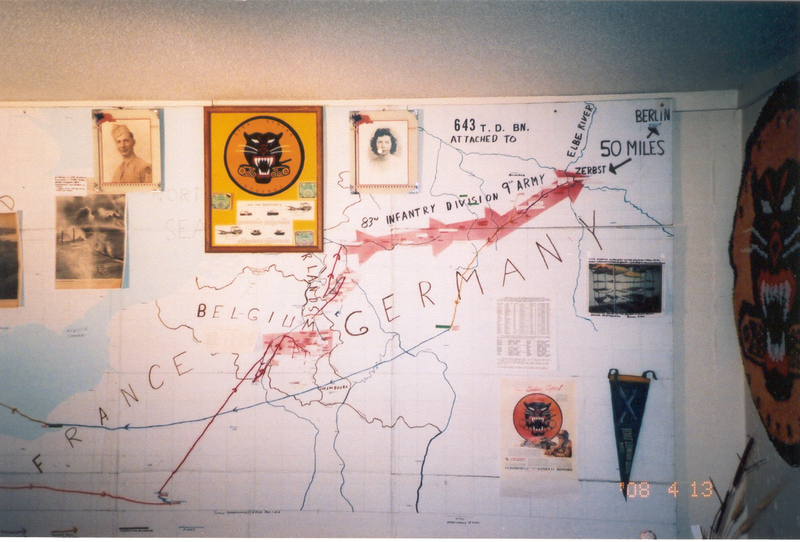 From Aachen, Bernie was transported to Liege, Belgium. "They operated on me in Liege and then sent me to Paris, where they were going to sew up the wound. But for awhile, they thought it was infected it. We didn't know it at the time, but I was allergic to almost everything adhesive. "I was finally discharged from the hospital on April 22nd and assigned as an assistant driver on an M-18 self-propelled tank destroyer. I was assigned to the same company I'd been in, but with a different crew. The M-18 was real light ... only 18 tons ... and it carried the same three-inch gun that the towed tank destroyer had used. "I was on my way back to my outfit when Germany surrendered on May 8th. I rejoined them on the 11th. They had been across the Elbe River to within about 80 miles of Berlin, but had to move back because of the Russians coming in. "We were assigned occupation duties and for about two weeks we also took classes on Japanese aircraft identification." About three weeks after Germany's surrender, the members of Bernie's outfit turned in their vehicles and were taken to Bad Nauheim, north of Frankfurt. From there they moved to Le Harve, France, shipped (Sea Robin) out and arrived at Newport News, Virginia on July 4th. C3 Cargo Ship "The Sea Robin"
"After a 30-day furlough, I was sent to the West Coast, arriving at Camp San Luis Obispo, California on V-J Day ... August 14th," Bernie says. "They had 36 brand-new destroyers waiting to take us to the Pacific, but the war ended. We spent our time playing cards and volleyball, eating, sleeping and fooling around." Bernie was discharged from San Luis Obispo on November 17th, 1945 and he arrived home on December 1st. "I visited several cousins around the country on my way home and took kind of a long route," he says. "The first night I was home, I borrowed my brother's car and piled it up. Nobody was hurt, but I did wreck his car." Bernie went back to work at the Erie Ordnance Depot, at the job he'd left what now seemed like a lifetime ago. "They'd promised me I'd get any raises I was due," he says, "just the same as if I'd never been gone. But when I got my first check, I saw that I was still being paid $5.52 a day. So I found a job at Libby-Owens and never went back to the depot." Bernie and Janice were married in June of 1947. They have a son, Gary, a daughter, Linda, six grandchildren and one great-grandchild. In February of 1948, Bernie used his G.I. Bill benefits to enrol at Bowling Green State University. "The G.I. Bill was one good thing that came out of the war," he says. "I got an extra 12 months of benefits because I'd been wounded. "I started in a pre-dental pro-gram and then found out that the G.I. Bill wouldn't pay for dental school. So I switched to education and, because I'd already taken the science courses, became a physics and chemistry teacher. But I did finish the pre-dental program, too. Just in case I ever had to go back to war, I figured the government might put me through dental school if I'd already finished the pre-dental program. I was happy teaching high school though and I never really explored the possibility of going to dental school." Bernie graduated from B.G.S.U. 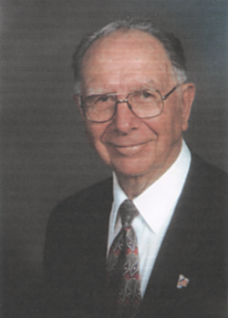 in 1952 and taught at Morenci High School until 1954. "Then I taught chemistry and physics at Napoleon through the 1968 school year," he says. "Then I went to Fremont and supervised curriculum development in the Sandusky County school system." He was there until he retired in 1983. Janice, meanwhile, taught for two years, then worked in the Napoleon school cafeteria for several more. After they moved to Fremont, she worked for many years in the Rutherford B. Hayes Presidential Library. In 1997, she and Bernie moved from Fremont to Archbold. "I liked my years as a teacher," he says. "But I don't know if I could have adapted to the breakdown in school discipline that occurred after the 1960s. When I started teaching, I decided I'd quit the profession immediately if the time ever came when I couldn't maintain control of my classrooms. "When I left classroom teaching in 1968, a widespread breakdown in student discipline was just beginning. If I'd been in classroom teaching in the '70s, I'm afraid the fur would have flown now and then." The 643rd Battalion holds a yearly reunion on the East Coast and Bernie has attended each year since retiring. "I was in the Army for 2 years, 11 months and 7 days," he says, "and it seemed like an eternity, with no end in sight. Lots of guys were in for much longer than that ... four or five years. "The six weeks of the Battle of the Bulge seemed like forever. I remember hearing a television interview with a veteran of the Bulge from the 75th Division and he said, 'There were times when living with the anxiety and the cold seemed worse than death.' That was true. There were times like that. It was so cold and the stress was incredible ... hour after hour, day after day. Bernie pauses for a moment, then continues softly. "But there were other times and other experiences. I vividly remember one night after we'd undergone a very heavy shelling. I was lying in my slit trench mulling over recent events and considering what might lie ahead. My feet were wet. I had removed my shoes and I had one under each armpit. "I was cold clear through, even though I was wearing all the clothing I had and even though I was wrapped in two wool blankets besides. I had no desire to be expendable ... to use the Army's definition of the G.I. ... and this created anxiety. "I began to pray, as I usually did before trying to fall asleep. After a considerable length of time in prayer, I felt a wave of warmth flood through my entire body. During those moments, I never got the feeling that I would make it through the war without injury or death. But I did get the definite feeling that, if death did catch up with me, I would spend eternity with Jesus. "Almost immediately I experienced the most peaceful sleep I'd been able to get since entering combat two weeks earlier. I'll never forget that night." 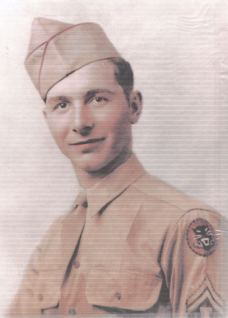 The information I have about Michael DeFibio is that he was killed at Barby (maybe Barbe) Germany on 12 April, 1945. He was in Recon Company. Recon is an abbreviation for reconaisance. Their job was to proceed ahead of the gun companies searching for the enemy, mines or blown bridges making it necessary to find a different route to get to their destination. They also had some equipment that they could use to mend shell or bomb holes in the road so the destroyers could reach their destinations too. As Defibio's platoon was traveling near Barby, they were ambushed. Six men were killed there just 3 or 4 weeks before Germany surrendered. Barby is near the Elbe River. On the same day, a man named Henry A. Syswerda was killed at Wernigerode, Germany. On the same day, our president, Franklin D. Roosevelt died. The information I have about Gerald K. Duncan is that he was killed on 9 January, 1945 at Reharmont, Belgium. This would have been during the Battle of the Bulge (Ardennes). He was in C Company. There were three gun companies in a TD Battalion. Co. A, Co. B, and Co. C. Each gun company had 12 tank destroyers that mounted a 76 mm gun. During the Battle of the Bulge, we had 76 mm guns towed by a half track. Each gun crew consisted of a gun commander, a gunner, a loader, a driver, an assistant driver and five ammunition handlers. I was an ammunition handler on 3rd gun in 1st Platoon of Company B. In our training before we went overseas, every man in a gun crew had practice on all of the jobs in a gun crew so that if a man in another job was wounded or killed, we could take over that man's job. When the battalion reached the Rhine river at Neuss, Germany, the towed 76 mm guns were replaced by self propelled M-18 tank destroyers that were equipped with a 76 mm gun. Most of us had been trained in 1942 and 1943 on self propelled M-10 TDs that mounted a 76 mm gun. At the end of 1943, a General McNair got the stupid idea that to attack an enemy tank with an equally expensive vehicle like the M-10 was a waste of money when a cheaper towed gun with the 76 mm gun could be used. He had no care for the fact that it took 10 men to operate a towed gun where an M-10 or M-18 had only 5 men in the crew. Also, the self propelled guns had steel shielding surrounding the men in the gun crew. The towed gun had a small shield that only 3 men could be protected from attack from the front. The flank and rear was completely without any protection from shrapnel or small arms fire. General McNair was killed in the Normandy invasion and we did not shed any tears when we learned of his death. You may know that the M-36 self propelled TD was provided for a few TD Battalions just before the Battle of the Bulge. It mounted a 90 mm gun. Our 76 mm guns could not penetrate the front of the German Panthers or Tigers. The 90 mm gun was more effective agaist the Panthers and Tigers. I don't know if this is the kind of information you are looking for regarding the 643rd TD Battalion. I have some information about an ambush of a column of TDs of our Company C near Hemmerden, Germany. Seven men were killed in that ambush on 2 March 1945. Two or three guns and halftraks were destroyed by a Panther or a Tiger. A platoon of Company A was overrun on 23 December 1944 at Baraque de Fraiture, (a crossroad in this location became known as Parker's crossroad in books written about the Battle of the Bulge) Belgium. Two men were killed, and between 15 and 20 men were taken prisoner. A few other men were wounded and hospitalized. Two towed guns and two halftracks were destroyed. Between 22 December 1944 and 8 May 1945 twenty seven of our men were killed. There were about 750 men in our Battalion. Many men were wounded, suffered frost bitten feet or had trench foot causing them to be hospitalized. To better know what you would like to know, please send me questions. If I know the answers to your questions, I will try to write to tell you what I know about them.